This morning I got up to try and beat the heat but I was too late. It’s supposed to be 96 and humid today which is Memorial Day and at 7:30 in the morning it was already most of the way there. 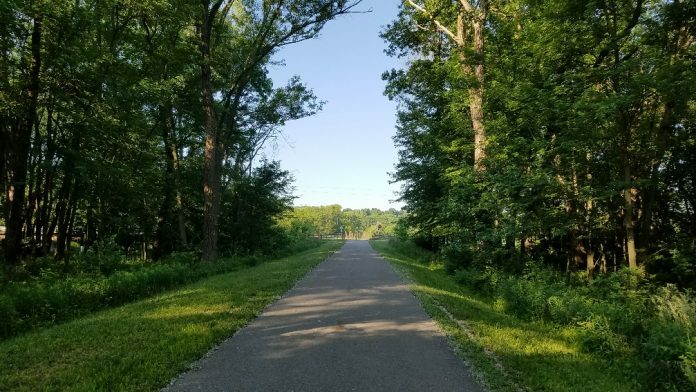 Still, I enjoyed my short walk along the Stevens Creek Bikeway, hearing a very loud bullfrog croaking beneath a bridge, and meeting friendly faces along the way, human faces that is. 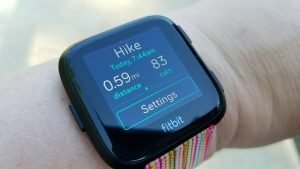 I used the walk as a good excuse to test and compare the GPS accuracy and heart rate sensors of the Fitbit Versa and the Samsung Gear Sport compared to a handheld GPS device and chest heart rate monitor. 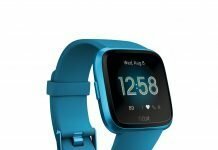 The Fitbit Versa (View on Amazon | View on Target) had been experiencing a lot of connection issues in my first month or so which I thought was throwing off distance estimates, or at least that’s what I attributed the inaccuracies to. However, I didn’t notice the Versa disconnecting once during this test. 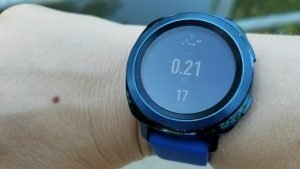 I’ve had the Gear Sport (View on Amazon) since November of 2017, the first day it was available to the public. It was one of the first YouTube reviews that I did. Since then I’ve learned to turn up the mic. Also, when I wrote the review for it I didn’t quite have my system down yet, so I wanted to revisit the Gear Sport and update the review. 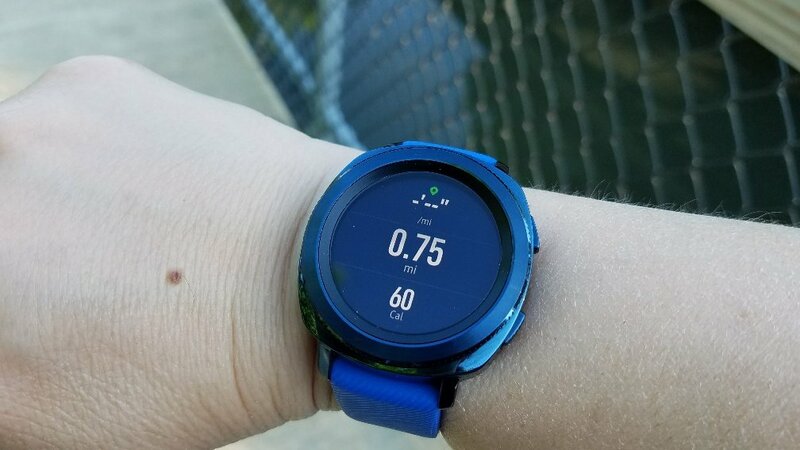 Plus, the Gear Sport has had several firmware upgrades since my initial review, so I thought it would be a good time to take another look at it because things can change. 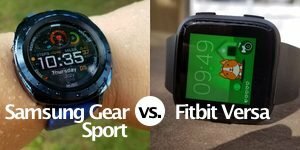 I would say right now that the Gear Sport has the edge over the Versa as a smartwatch. There’s more apps, and more importantly, better apps to choose from – at least as I’m writing this in May of 2018. 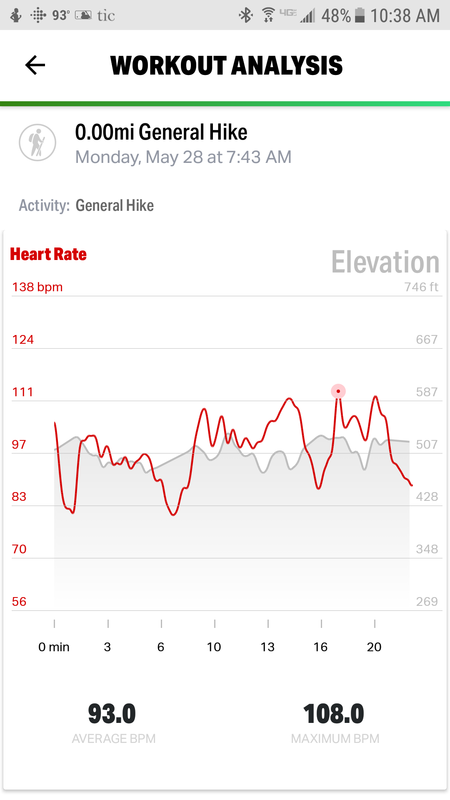 Anyway, in this test I was comparing the heart rate sensors and the GPS accuracy of both the Versa and the Gear Sport and the results are below. 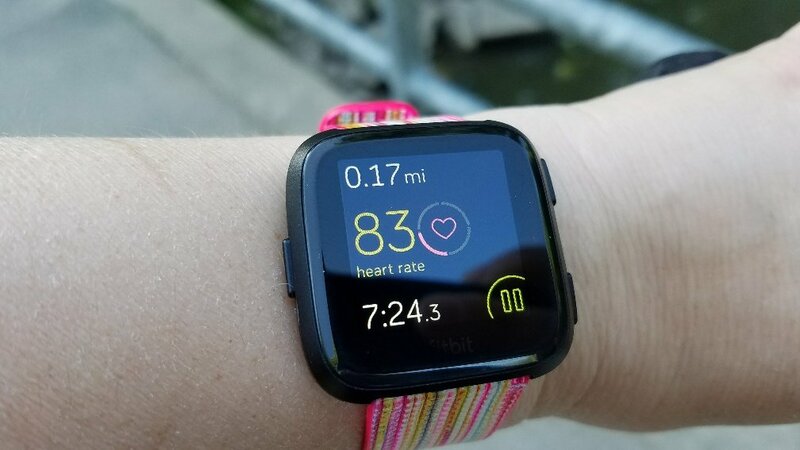 Of course, the Versa uses connected GPS which requires it to be paired with a smartphone. The Gear Sport has a built-in GPS but also offers the option to use the GPS from your phone. 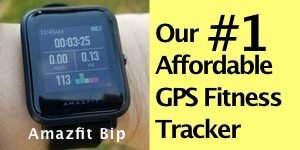 You can choose GPS + wireless, wireless only, or use only the watch’s GPS. In this test, I just used the built-in GPS on the Gear Sport. 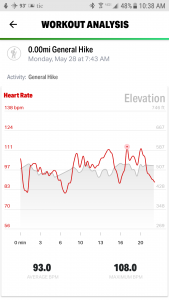 I also had MayMyHike™ running on my phone which was paired with the Wahoo TICKR®, a chest heart rate monitor. First, lets get to the GPS estimates of my short walk. Hey, it was hot outside! 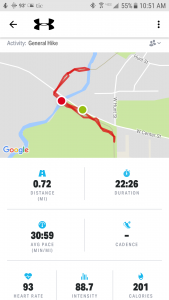 Throughout the walk, I kept an eye on the distance estimates of all 3 devices and the Gear Sport was either estimating exactly the same distance as the Garmin eTrex 20, or only differed by a very small amount. 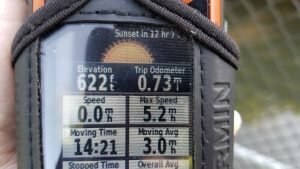 Below: In the images below, the Gear Sport is estimating .21 miles and the eTrex .22 miles. During this same checkpoint, the Versa’s distance estimate was .17 miles, as seen in the image below. 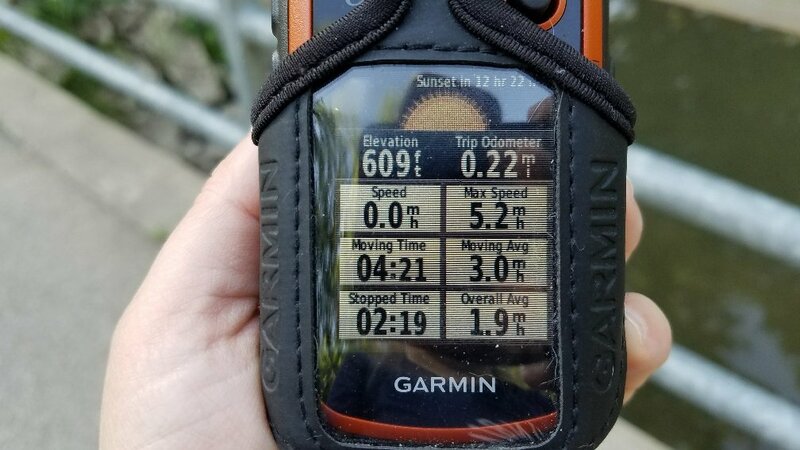 The Etrex estimated .73 miles while the Gear Sport estimated .75 miles, so very close between those two. The Versa estimated .59 miles, so even though I didn’t notice any connection issues, the distance estimate still fell short, and that’s been my experience with the Versa. Meanwhile, MapMyHike which also used my phone’s GPS was running and it estimated .72 miles. So, the inaccurate distance estimate of the Versa doesn’t appear to have anything to do with the accuracy of my phone’s GPS. Hopefully, Fitbit can roll out a fix for this soon because it appears to be a software issue. 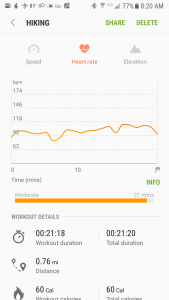 Onto the heart rate sensor comparison of both… Throughout the walk, the Versa and the Gear Sport were very close in their estimates of my heart rate. 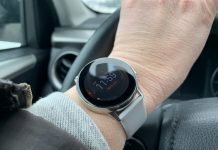 I was wearing the Versa on my left wrist, as I normally do, and the Gear Sport on my right. 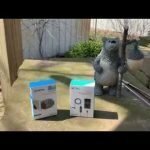 Typically, I get better results from most of the watches I’ve tested when wearing them on my left wrist. 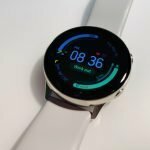 The only exception has been the Ticwatch 2 and the Suunto Spartan Trainer WHR. The Wahoo TICKR (View on Amazon) estimated my average HR at 93 and max HR at 108. 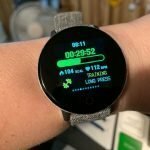 The Gear Sport estimated my average HR at 100 and max at 114. 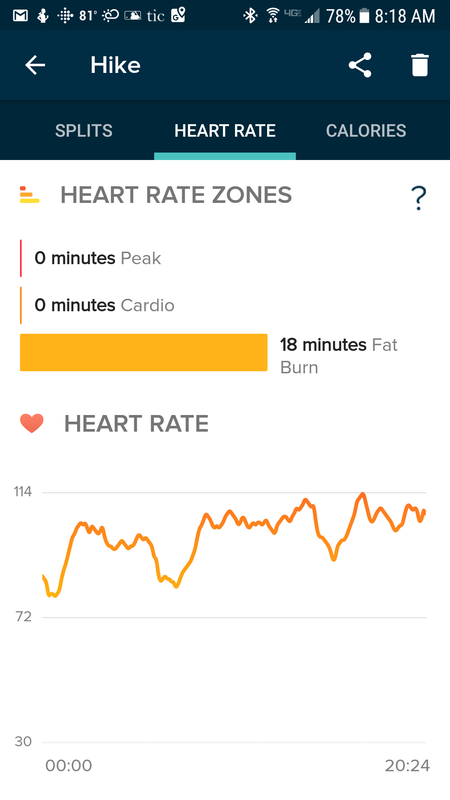 The Fitbit Versa estimated my average HR at 99 and max at 114. 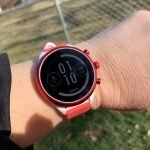 So the Gear Sport and Versa were practically identical. The TICKR seemed a bit low to me from my average HR. 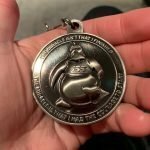 I’m going to upgrade to a Polar or Garmin CHRM soon. At any rate, both the Versa and Gear Sport did a good job with my heart rate and that’s been my experience with both of them in the many tests I’ve done, although I would give the Versa the highest marks for HR accuracy. So, that was my test this morning. I was very pleased with the GPS results of the Gear Sport. 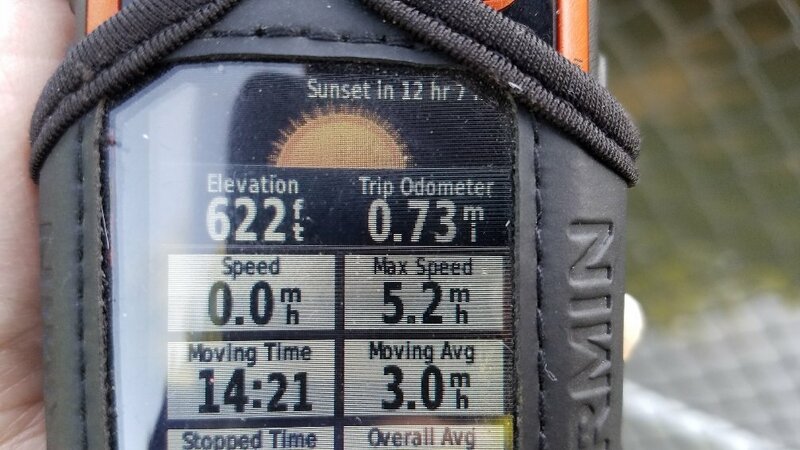 It did terrific compared to a handheld GPS unit, and probably better than anything I’ve tested so far against it. 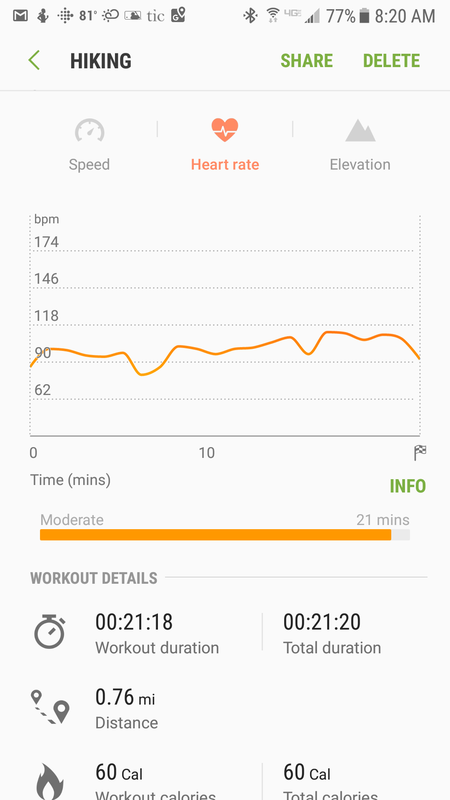 The Versa is still underestimating distance and it appears to be some type of software issue with the Versa. During this test it remained connected to my phone throughout, so that wasn’t an issue. 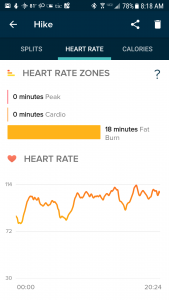 I’ll let you know if Fitbit makes any changes that improve GPS accuracy on the Versa. 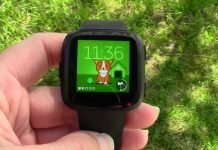 Previous articleTicwatch Pro is Coming This Summer!